Finally a rather interesting election results story. A deceased brothel owner won a state assembly seat in Nevada. 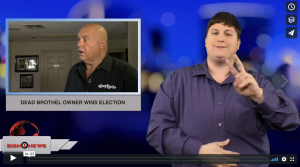 According to the Nevada Secretary of State’s office, Dennis Hof won the election for Nevada’s 36 Assembly District Tuesday night. The Republican defeated Democratic challenger Lesia Romanov by over 7,000 votes. The problem is Hof died last month. According to state law, county officials will appoint a fellow Republican who also resides in the district to fill the seat. Hof, a self-proclaimed pimp, was found dead October 16 after celebrating his 72nd birthday at one of his ranches.